After its founding in 1989, IPF’s first major project was reconstructing the “Weller Curve” at Mile Marker 49 on Highway 82. This complex, multi-year project involved relocation of the existing roadbed, reconstruction and revegetation of the roadside slope, and the development of a new parking area and trailhead for the popular Weller Lake Trail. The project required close cooperation among IPF, the Colorado Department of Transportation, Pitkin County, the US Forest Service, and various private contractors. The success of this project provided momentum for IPF to pursue additional projects in the years ahead, and became the model for ongoing cooperation between IPF and other land management agencies. IPF’s next and largest project to date was to restore the massive scars marring the top 1-1/2 mile stretch of Highway 82 west of the summit, known as the Top Cut. 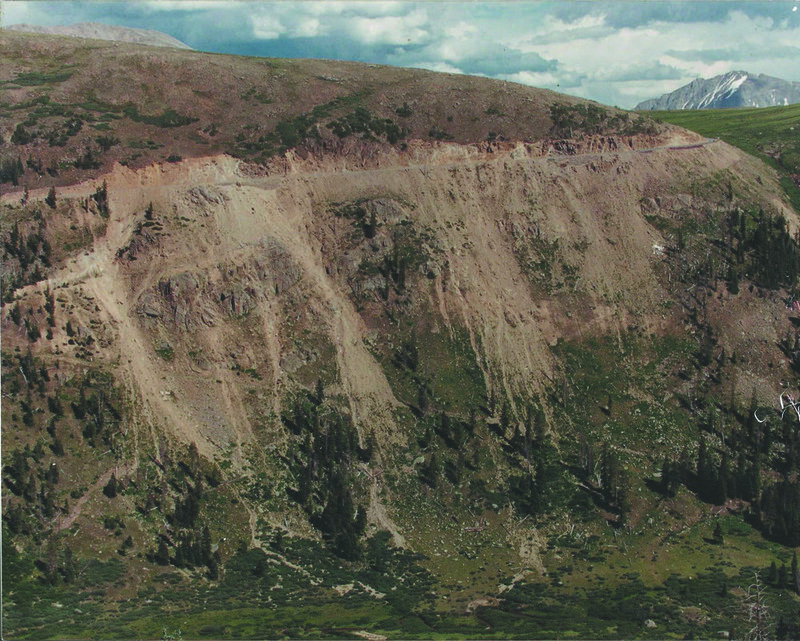 Erosion, which was set in motion when the 1882 stagecoach road was transformed into Highway 82 over Independence Pass, had steadily devastated several ecosystems from the alpine tundra down into the meadows below, threatening the pristine Roaring Fork River. The Top Cut is divided into a series of smaller road "cuts" that were made to widen the roadway for automobiles. Construction of native rock retaining walls at the Twin Gullies, Big Cut and Middle Cut, and revegetation of the barren eroded slopes were daunting undertakings for this small organization. Begun in 1996, the wall building at the Top Cut continued over 13 years, with the final rocks placed in the Middle Cut Wall in 2008. Revegetation throughout the Pass corridor continues to play a substantial role in the Independence Pass Foundation's restoration work. Since 2004, IPF has undertaken a series of "compost blanket" projects on the steep and severely eroded hillsides below the Top Cut. The lack of organic nutrients in the soil limited the natural revegetation of the slopes below the road. Begun on an experimental basis in 2004, the compost blankets have proven over the years to make up for this deficiency. Organic compost impregnated with native grass seed is spread over the slopes with a blower. The annual growth/dieback cycle that plants undergo replenishes organic material, helping the grassy areas to become self-sustaining. In 2013, IPF completed the last of these massive and challenging projects, with the results now visible for all to see. From the start, our work has been a community endeavor. Hundreds of residents have spent countless hours helping IPF remove snow fence debris from the summit of the Pass and install thousands of plants at many sites throughout the corridor. A range of groups has participated: Roaring Fork Valley school children, other nonprofit groups, service organizations, and the Buena Vista Correctional Facility inmates. Once barren places on Independence Pass have been transformed. All along the roadway, wildflowers, grasses, shrubs, and trees are thriving. Wildlife, recreational value, water quality, and air quality all benefit from these efforts. IPF has been privileged to serve for 30 years as stewards of Independence Pass, and to engage the Roaring Fork Valley’s children and other volunteers in that work, giving them a lifetime connection to, and sense of ownership in, one of the great backyards in the world.